We offer the only private residence for rent on Playa El Tunco to Esymar. The property is located directly on the Pacific Ocean offering direct access to world to class surfing. This house is great for families, small groups and couples. The Spanish to Colonial designed house has several terraces, outdoor dining and living room, bar, swimming pool, barbecue area; landscaped with coconut and other palms, plumeria (Arbor de la Cruz) trees and various landscape plants. The gated and secured residence also is equipped with Wi to Fi, Air condition in 5 of the rooms, TV (cable), kitchen and on to site parking for guests. The Estate has a total of 6 bedrooms and 5 bathrooms available to accommodate up to fourteen (14) persons total. Single rooms can be rented for pricing and requirements. Rooms are equipped with ceiling fans. 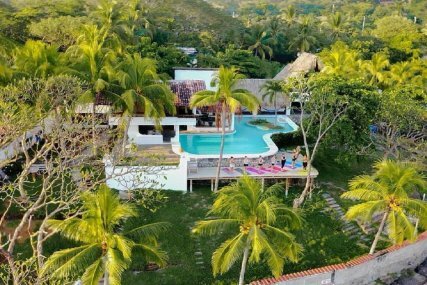 This is truly a unique property located on the southeastern end of Playa El Tunco, directly on the Pacific Ocean. A surfers paradise and ideal for a quiet ocean to side retreat. The property has panoramic views to the ocean and private access to the beach. Playa El Tunco is 40 minutes away from the International Airport of Comalapa , and 40 minutes away from the City of San Salvador. Over the last few years Playa El Tunco has become known as one of the best beaches and surf destination in El Salvador. Its magic and enchantment makes it a very special and attractive place that caters to a wide variety of interests. Playa El Tunco offers restaurants, shops, and entertainment; and, recently, wellness facilities, i.e., yoga, massage. Our beach house is located directly on the Pacific Ocean, with access to world to class surfing, relaxation and boasts of awesome sunsets. The city of San Salvador is 40 minutes driving distance from Playa El Tunco, where you can find world to class shopping malls, various restaurants, cinema's and more. Nearest Airport: Comalapa International Airport (40 kms). Other BEACHES : Punta Roca, (4 kms to world championship surfing beach) and many many more! We offer the only private residence for rent on Playa El Tunco to Esymar. The property is located directly on the Pacific Ocean offering direct access to world to class surfing. The Spanish to Colonial design house has several terraces, outdoor dining and living room, swimming pool, bar, and barbecue area. The gated and secured residence also is equipped with Wi to Fi, Air condition in 5 of the rooms, TV (cable), kitchen and on to site parking for guests. The Estate has a total of 6 bedrooms and 5 bathrooms available to accommodate up to fourteen (14) persons total. Single rooms can be rented. 1) A bedroom with 4 twin size beds, private bathroom, a closet, a/c, infront of the pool. 2) A bedroom with 2 twin size beds and 1 queen size bed, private bathroom, closet, a/c, infront of the pool. 3) A bedroom with 1 queen size bed, a closet, with a beautiful view of the ocean, a/c, shared bathroom. 4) A bedroom with 2 twin size beds in a second floor, a/c and shared bathroom. 5) A bedroom with 2 twin size beds , private bathroom, a/c, in a second floor with a beautiful view of the ocean. 6) A bedroom with 1 King size bed, a little balcony, two small closet, in a second floor, shared bathroom and a ceiling fan with an amazing view of the ocean. Esymar is located on the Pacific Ocean to a renowned surf destination close to nightlife, the airport, and San Salvador. This house is great for families, small groups and couples. Your balance is due to the property 3 days before arrival. The Property will contact you to collect payment. If you book within this 3 days then the property will contact you shortly after you book to collect the balance.